Christmas Cookies is a collection of 36 very unique, 3" high resolution Christmas Sugar Cookies my daughters and I made; a background paper that is solid cookies; and 3 QP's - a cookie frame on solid sugar cookie, a cookie frame against a lit Christmas tree and a collage with frosted panes and "Merry Christmas" with snowflakes on the bottom window! The possibilities are endless with this kit! $4.99 at my PayPal store. Click image to enlarge. Click Buy It Now button below the preview to purchase. 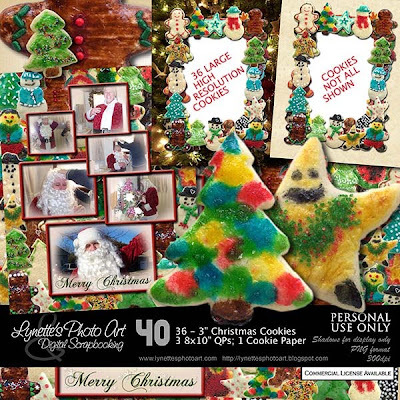 Today I'm giving you a cookie to sample the kit - enjoy! Great kit, thanks so much! Thank you for your lovely freebie. Thanks for sharing your talent...This kit is wonderful.